presents John Handley's Telebomb, now out in hard cover. Purchase Telebomb now at Amazon.com! "Lost Opportunities by the Cable Companies"
The Telecommunications Act of 1996, designed to bring competition and growth to a monolithic industry through deregulation, was instead the final catalyst in detonating the "telebomb"--an epidemic of problems, from customer frustration and stockholder revolt to financial crisis and outright crime. With telecommunications now encompassing not only the telephone industry but also cable television, Internet, and wireless providers, the stakes grow higher--and the terrain riskier--every day. What are the industry and the regulators doing about it? Not nearly enough, argues John Handley. 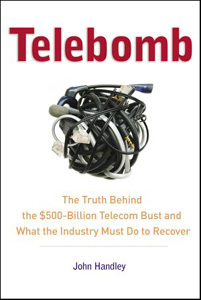 Telebomb describes the origins of the mounting crisis and follows, point by point, the trajectory of the industry, from before the 1984 AT&T breakup, through the sky's -the-limit late 1990s, to the cutthroat chaos of today's telecom megacorporations. And it describes both the perils of inaction and a workable plan to help the industry right itself. Telebomb poses and answers the fundamental questions born of these trends and their outcomes: How could these companies raise, spend, and lose so much money in so little time? What could have been done to stop (or at least slow down) the collapse of so many companies and the loss of hundreds of thousands of jobs? And, of course, how do we avoid a second telebomb? The infrastructure, technology, and knowledge are largely in place. It's what's done with them that will determine the future of our telecommunications and media landscape. JOHN HANDLEY is an author and telecommunications consultant. Previously, he was a partner at Accenture, where he worked with each of the major telecommunications carriers in North America, including Verizon/Bell Atlantic/GTE, SBC/Ameritech, BellSouth, Qwest/USWest, AT&T, Lucent, Sprint, Bell Canada, Alltel, MCI/Worldcom, and Global Crossing. His practice areas included new technology deployment, capacity provisioning, network operations, and the development of practical content delivery networks. Mr. Handley is based in Falls Church, Virginia. To send a message to John, click here.